Perhaps not the "computer geek" you were expecting? There is no tape on my glasses! I was riding motorcycles nearly ten years before I touched my first computer. So I guess they are my first passion. This bike is my third Harley it is a 1986 Softail with only about 28,000 miles on her. I bought her in 1990 from a man who had not ridden it for 3 years and was in excellent shape. Several summers ago a good friend was getting married 600+ miles away in Syracuse and I rode up on a Friday with my friends, Mike Chaney and Dave Dixon, for the wedding and came home on Sunday. I hope to ride to Colorado some summer for a visit. 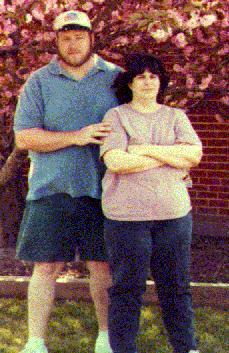 This picture is of me and my lovely wife Karen standing in front of our house in Virginia with our tree in bloom. We have been married over 22 wonderful years!